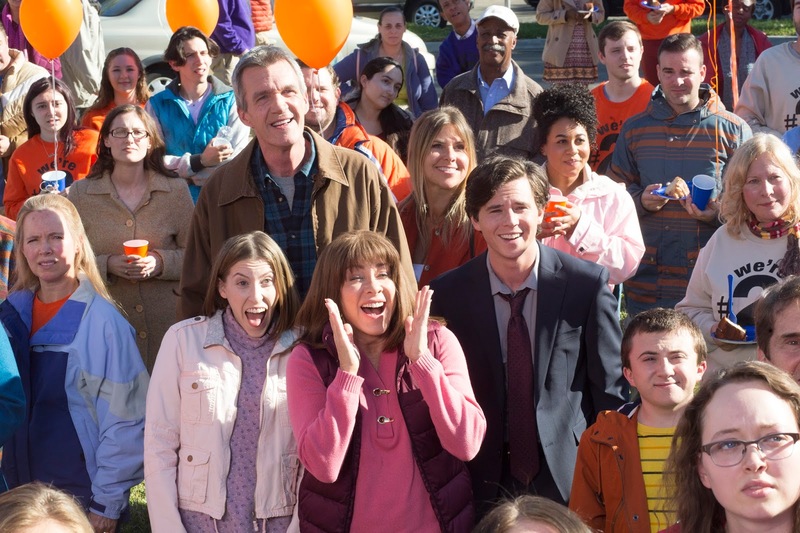 The Middle has come a long way since its debut in fall 2009. Two hundred episodes to be exact. And in this landmark episode for the series, some old recurring cast members have returned. The episode begins with Axl trying to get one of his family members to answer his phone, and it's hilarious when they don't want to until he reminds them that it could be a response from one of his job applications, and when he gets a job he can move out. When Sue answers the phone, she is believed to be Axl's assistant, so Axl gets Sue to act as his assistant, which leads to some entertaining moments. Sue agrees to help him, but she makes him promise to not make any more jokes about freezing her head when she dies. When they get to the interview, Axl is suddenly worried, so Sue physically forces him to go in, which is hilarious. Nancy and Ron Donahue come over to the Hecks' to inform them that Orson has been named the 200th most livable city in Indiana. They are going to celebrate this along with the cow re-dedication, which reminds Frankie that she still needs an item for the time capsule. She has a funny interaction with Mike about this: "What is the matter with me?" "That's a list we don't want to get into before bed." Mike finds out that Bill Norwood and his wife are getting separated. He doesn't really care at first, and it's funny when he explains to Frankie that he doesn't know more because Bill started crying, so he went into the house. When Mike later has Bill over, Bill makes Mike realize how great his life is. Mike starts to express how grateful he is for his family, which they are hilariously and reasonably weirded out by. After concluding that Cindy still has feelings for him at the end of the last episode, Brick confronts Cindy to find out for sure. It's hilarious when he tells her who it is when he approaches her. Cindy tells Brick that he has to perform three acts of bravery in order to get her back. He comes up with two, but is unable to come up with a third. In the end, he admits this to her, and she counts him admitting he was wrong as the third act of bravery. At the cow re-dedication, there are appearances from a couple of characters that we haven't seen in a little bit, the cheerleaders that Axl and Sue went to high school with and Mr. Elhert, who makes everything all about his business instead of about Orson. After his speech disappoints the crowd, Mike decides to speak, and his speech is great, as he talks about what he likes about Orson, and reveals that he put a hammer that Bill lent him in the time capsule because that's what this town is about. After this, the 200th visitor to Orson that day arrives, and Ron tries to stop him and give him a gift basket, but the car hits him. It's really funny when Frankie steals a coupon from the gift basket. At the end of the episode, Frankie and Mike talk, and it's funny and very in-character when Mike says that he would probably feel the same way about his life if he met someone else instead of Frankie and lived in a different town. This episode had a lot of funny moments, and the stories were great. I didn't love Brick's part of the episode as much as the rest, but I still enjoyed it, and it had its moments. The episode found a great way to celebrate 200 episodes of The Middle while not going too over-the-top on appearances from past cast members and the like. What did you think of "The 200th"? Leave your thoughts in the comments!